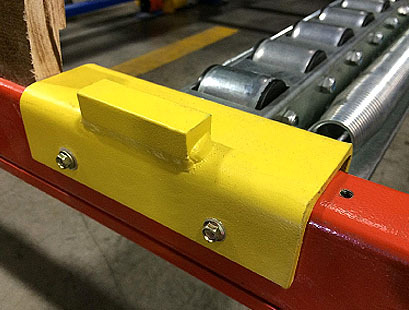 Recently Exglobe, maker of the horizontal flow rail featured on our website, announced the upcoming launch of a new product that allows existing pallet rack to be used as pushback rack without the carts and retrofit expense typically incurred. I contacted Exglobe’s U.S. sales manager, George Bally, to ask a few questions about the new product. Cisco-Eagle: A couple of years ago ExGlobe announced the Flow-Rail product here in the U. S. and we found it to be truly innovative when it comes to flow rack functions. Now you have the Spring-Rail Pushback system. How does it differ from the Flow-Rail product? George Bally: Spring-Rail is also a pushback system like Flow-Rail, however, the operating mechanism is different. 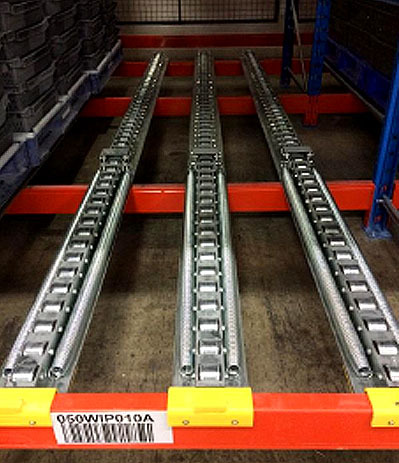 Spring-Rail uses spring power to bring pallets forward whereas Flow-Rail relies on the force of the lift-truck combined with the weight of the pallets pressing down on the teeth of the Flow-Rail chain to bring pallets to the front. Cisco-Eagle: So, even with this new system there’s no need to install the pallet rack with a slope to the pallet run over the rack beams? George Bally: Yes, that is correct. Both systems can be installed on new or used conventional support beams. However, with Spring-Rail, instead of placing the track on top of the support beam it is recessed behind the front support beam. This means if pallets are 48’’ deep and the front upright is 54” wide, the system does not create any additional vertical height. This benefit is a considerable advantage over Flow-Rail and other conventional pushback cart systems. 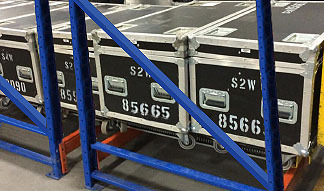 Cisco-Eagle: So, if we’re talking about storage gains, how many more pallets can you put in your rack but still have the flow benefit? George Bally: That will depend on available space and pallet height. One thing is clear, if a high-density storage system does not add any height, it’s difficult to do better. Cisco-Eagle: This new product uses industrial spring tension to move the pallet forward – what kind of cycle numbers can you get before the spring loses its strength or breaks? George Bally: The product is rated for 10,000 cycles. This means 10,000 full extensions and retracts. Since there are 2 springs per track the combined effort of 4 springs per storage lane guarantees long-term performance. As an indicator, if a lane is fully loaded and unloaded 4 times per day, that represents approximately 1,000 cycles per year. Cisco-Eagle: What drove the search for going with a spring system? George Bally: While Flow-Rail is a great product it does have a few drawbacks: fork-attachments are required in order to operate the system, the system often creates an accumulation of wood chips in the front, the weight of pallets in a lane must have more or less the same weight, and makes case picking complicated because when the front pallet is empty it must temporarily be replaced with a loaded pallet to advance pallets behind, etc. Spring-Rail was developed to specifically remove all these limitations within a similar 0 degree pitch system. In addition, Spring-Rail is much more compatible with plastic pallets and can even manage different size pallets within the same storage lane. Cisco-Eagle: Is there any danger to workers if a spring should break? George Bally: No risk whatsoever. A security cable is run front to back which secures each spring to prevent risk of any accident. Cisco-Eagle: The Spring-Rail system accepts up to 4 pallets deep. Is this a design limitation or is it a matter of what the most popular rack depths are? George Bally: For now it is a design limitation but we’re currently working on a solution that could potentially increase up to 8 deep lanes. Cisco-Eagle: There are no special forklift attachments to use this system? George Bally: No, and because the springs do all the work during unload, drivers who have operated the system say it is very much like working with regular selective rack. Cisco-Eagle: How about special training in using the system? George Bally: Minimal training is necessary. When drivers load pallets they must lean the load against the front pallet stop. During unload the front pallet is simply lifted off the tracks and the driver slowly backs-up as he would do with conventional pushback. Cisco-Eagle: What other benefits does the Spring-Rail offer over the Flow-Rail product? George Bally: Quicker install. Tracks are shipped fully assembled, which means installers simply have to secure the tracks to the beams using tek-screws in front of the track and in back. On average it takes 2 workers 15 to 20 minutes per lane (2 tracks). Cisco-Eagle: Are there other benefits to this new system in regard to storage/retrieval times? Other benefits? 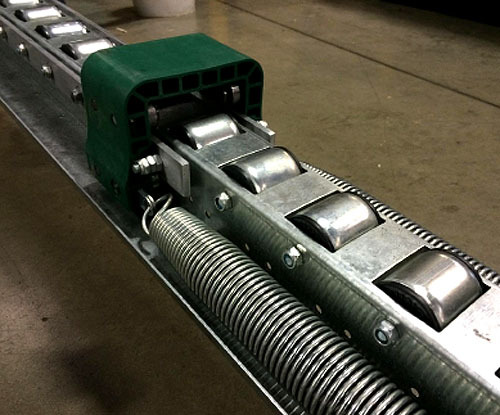 George Bally: Spring-Rail can be used to store non-palletized material. In order to do this, tracks are set on risers that are fixed to the support beams. These risers are typically 4″ to 6’’ tall. By raising tracks off the beams, lift-truck forks have space to enter above the front beam. This means product such as wood boards, cases, rigid slip sheets, etc. can be entered and set on the Spring-Rail tracks. All this creates new high-density storage possibilities for some customers. Cisco-Eagle: How soon will we be able to begin offering this innovation to our customers? George Bally: Now is a great time! Spring-Rail material will be available starting late April early May 2016. Because of the close working relationship Cisco-Eagle has established with ExGlobe, the Canadian manufacturer has released product information to us early and is allowing our sales force to begin offering this terrific alternative to traditional pushback rack now. Please download an informational pdf here (69 KB, Opens in new window) or call us to receive a product pamphlet, to ask questions, or request a quote. We will be happy to assist you at any time.